Now that you have decided to take your online store idea live, you need to find the right platform that can support it. There are plenty of websites that support eCommerce stores, making it so much easier for you to get online and start selling. With the multiple options various online website builders offer, there is no need for you to learn coding or invest in different features. In this article we will compare 3 top eCommerce platform providers in India Shopify Vs Wix Vs Shopnix. All these eCommerce providers gives you everything you require to sell online. You get it all in one pretty package! When it comes to the major players in eCommerce in India, you have Shopnix, Shopify and Wix. While Shopify and Wix have been around for a while now, the latest entrant that is all set to disrupt this space is Bangalore-based start up, Shopnix. They all have powerful capabilities, are reliable eCommerce platforms and are highly popular among various online stores that are successful today. So which one do you choose? In this article, we take a look at the features of Shopnix vs Shopify vs Wix, so that you can choose the right one for you. Ease of Use – Which eCommerce Platform is User Friendly? Setting up a shop has to be quick and needs to be effective. There is nothing more frustrating than having to spend a week just trying to figure out how to set up your online store. 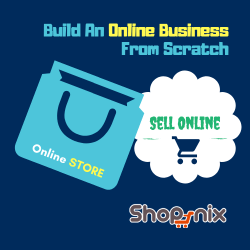 Fortunately, platforms like Shopnix, Shopify and Wix have greatly simplified process for first time online store owners. 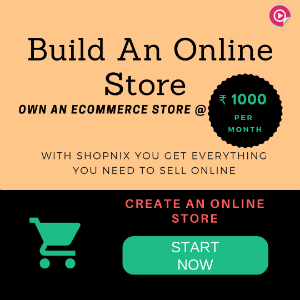 Shopnix lets you get started almost instantly, by clicking the huge ‘Click to Create an Online Store’ button on their homepage. Then, you just need to type in a store name and your contact information and voila! You are taken to a page where you just need to select some options to personalise your store and you are ready to go. All set and ready to go in seconds. With Shopify, you have guided tours to help you get started. Some of the technical options can seem a bit complicated, so you may need a little more hand-holding if you aren’t that familiar with the advanced features. Wix is really easy to set up if you want a basic website. If you want something with more powerful options, however, you may be disappointed. Of the three, Shopnix has a good balance of advanced features with a clean interface with all of the onboarding steps clearly listed out, so I would probably choose this one. Another great feature about online shop builders is that they offer a whole set of ready templates that you can select from for your store. With a few tweaks, these templates and themes can be customised for your specific product. With Shopnix, you have a several free templates that you can choose from for your online store. You can choose from different categories of themes, like responsive themes that display well on mobile and web. The best part is all of these templates are free, so you never have to pay for them outside of your subscription. Don’t Forget To Check Our Latest Theme:- ATHENA. Sure that this theme is going to blow your mind. Shopify too has a lot of templates as well, but some of these are paid. You have the option to edit the HTML/CSS of these templates for advanced customization, which complicates the process, but you also have the option to drag and drop features that you would like to include. With Wix, the drag and drop editor seems the clear winner. Unfortunately, you don’t have the option to edit the HTML/CSS of the Wix templates, and there are a lot of great looking templates that you need to pay extra for. For the best value of money, I would pick Shopnix over the rest but if you want more customisation options, you could go with Shopify. Inventory management is one of the most important features product based eCommerce stores look forward to. The key is having a platform that can make the inventory management process as painless as possible. With Shopnix, any product seller will be thrilled at the simple to use inventorying dashboard. With a few clicks, you can view all your products in one place, and can set discounts, taxes, labels, etc. With Wix, there is a clean way to view inventory, but not as many features as Shopnix offers. You can view products and change availability from the dashboard and will have to go to individual items to change certain option. Shopify is also really simple to use, with a search bar to look for specific products. You can manage gift cards, create new products and choose collections with just a few clicks. The winners in this category are Shopnix and Shopify, with Shopnix being the best choice for Indian store owners who need to change tax percentages according to GST. The next eCommerce feature that is crucial to your success as an online store is the payment gateway that is available to your customers. Customers like to have different payment options made available, with the top choice in India being cash on delivery and online wallets. Shopnix does a marvellous job of offering several payment options, with credit/debit, cash on delivery, netbanking and online wallets like DirecPay, PayU, PayPal and many others. Shopify offers all the usual payment gateways as well, with a bonus being EMI and UPI. This is perfect for customers who don’t want to deal with the extra step of option for EMIs through their credit card company so they can select the EMI option directly from your store instead. Wix offers limited payment options compared to Shopify and Shopnix. You will have to separately sign up for online wallets payment options on Wix. Shopify emerges as the frontrunner in this particular category with the most diverse payment gateways. Online store builders have learned the value of offering add-ons in the form of apps and various other technical features that make it so much easier for shop owners to begin selling. Apart from managing your cart, orders and dropshipping options, etc. it is very useful to have apps that can improve your selling experience. Shopnix allows you to manage customers, pull reports including tax and invoicing and other options including discount coupon, gift card and rewards management. These are useful and relatively simple to use. Wix offers a lot of apps and features that any website owner would be happy to have. That said, they are not as focused on eCommerce as they should be since they cater to all website owners. Shopify on the other hand wins hands down with all of the apps available that are specifically targeted to eCommerce owners. Shopify also offers more technical features by allowing owners to peek under the hood and change some of the coding if they are familiar with advanced features. If you want more eCommerce options and are willing to spend extra on them, then Shopify might be your first choice in this section. Comparing eCommerce features mat not be as easy as said. Every ecommerce platform provider comes with their own special features and limitations. The feature comparison between Shopify Vs Wix Vs Shopnix is limited to multiple factors. What we recommend is that you try all 3 pre-build platform providers and then compare the benefits. Experience the platform and then jot down, it’s better if you compare it on an spread sheet Shopify Vs Zepo Vs Shopnix. It’s 2018 and shop owners need digital marketing integration ready for their online stores if they are to get any attention from online shoppers. Options to set up a Facebook page, send out emails and even create SEO based blogs, can be crucial to online store owners. If you want this all in one place, the recommendation is to go with Shopify or Shopnix. Wix on the other hand comes a close second because these digital marketing features aren’t as targeted towards eCommerce store owners. You do have the option to add SEO and the basic digital marketing features but these options aren’t as diverse as the rest available. Shopnix has Facebook and Google integration for its site. You can use MailChimp for email management and other apps for marketing options. Shopnix is ideal for those who are looking to start an online store at the least investment possible. When you are in trouble with a payment or just need quick help with your online store, you will need a good support team. The online platform you choose should have all the answers to your queries, should be prompt in responses and should provide you with resources to improve your ability to sell, and to be more successful. Shopnix has an extensive blog with several knowledgebase articles devoted towards teaching new store owners how to be successful online. All of the articles are curated by experts so you know you are getting the more relevant help. You also have multiple channels for customer support, including a hotline to call for help. Shopify and Wix offer various customer support channels too, including email, chat and phone among others. The caveat with these sites is that for more priority attention you will need to pay more. Shopify has an impressive resource centre with guides and articles for eCommerce entrepreneurs. Therefore, if you are looking for offline help in the form of resources, Shopify wins but if you would like to have the support you need included in your subscription you may want to choose Shopnix. We now come to most important part of an online provider selection: the price! Getting the right online store provider boils down to the low cost packages and features provided and also for any other pay as you go features that the platform includes. Among the three, Shopnix is the right priced option for eCommerce owners. It offers a 14 free trial period after which you can choose from four package options: Quicky, Starter, Pro and Premium. All of the packages are curated to meet the customer needs. Every packer contains additional features that help you make your online store look more appealing to people and to sell more. So you need to choose the package according to the number of items you would like to list on your site. The great part about Shopnix is that the other apps and services are all included within your subscription. Shopify also offers a free trial for the first 14 days. You can upgrade your site using three different packages: Basic Shopify, Shopify and Advanced Shopify. While the number of products you can sell is unlimited on all the plans the number of staff accounts and advanced features varies with each subscription plan. Wix offers a 14 day money back guarantee and also offers you a free site if you don’t want any of the eCommerce options. The subscription packages are based on what you wish to use your website for. There’s eCommerce, Unlimited, Combo and Connect Domain, all of which are very reasonably priced per month. However, keep in mind that there are several pay as you go features as well that you will need to budget for as you set up your site. Shopnix offers more value for money in terms of pricing, compared to Shopify and Wix. So how did the three square up? When it comes to user experience and features, Shopify ans Shopnix are two winning platforms to use. The only drawbacks with Shopify is that some of the more advanced features can be intimidating to eCommerce owners with limited technical knowledge. That combined with its high cost of usage can make Shopify out of reach of small store owners who need to scale up cheaply yet quickly. Wix on the other hand is primarily an online website builder with eCommerce features also available as an add-on. That is why some of the features may not seem dedicated towards helping you succeed as an online store owner. Shopnix has the perfect balance of great features, low pricing and as a new entrant is constantly evolving to offer even more services to online store owners. Major brands like Sapna Book House and KiranaWalla have embraced this platform to find a wider customer base with ease of selling. For the purposes of our review, Shopnix is the best eCommerce provider for an India based business with low capital requirement. With just a few clicks you can get started and start selling. Why don’t you try setting up a free account and see how easily it is done?